MINNEAPOLIS-For the 11th consecutive year, a Polaris RZR® took the top spot on the King of The Hammers podium. 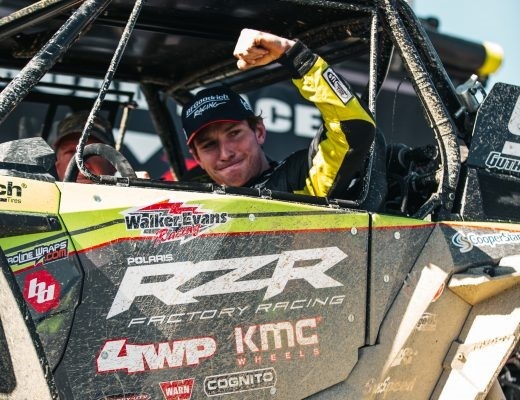 Polaris RZR Factory driver Mitch Guthrie Jr. secured his back-to-back win in Johnson Valley, Calif. in the all-new RZR XP® Turbo S Velocity. Polaris Industries Inc. is a global powersports leader that has been fueling the passion of riders, workers and outdoor enthusiasts for more than 60 years. With annual 2018 sales of $6.1 billion, Polaris’ innovative, high-quality product line-up includes the RANGER®, RZR® and Polaris GENERAL™ side-by-side off-road vehicles; Sportsman® all-terrain off-road vehicles; Indian Motorcycle® mid-size and heavyweight motorcycles; Slingshot® moto-roadsters; snowmobiles; and pontoon, deck and cruiser boats. Polaris enhances the riding experience with parts, garments and accessories, along with a growing aftermarket portfolio, including Transamerican Auto Parts. Polaris’ presence in adjacent markets globally includes military and commercial off-road vehicles, quadricycles, and electric vehicles. Proudly headquartered in Minnesota, Polaris serves more than 100 countries across the globe. Visit www.polaris.com for more information.